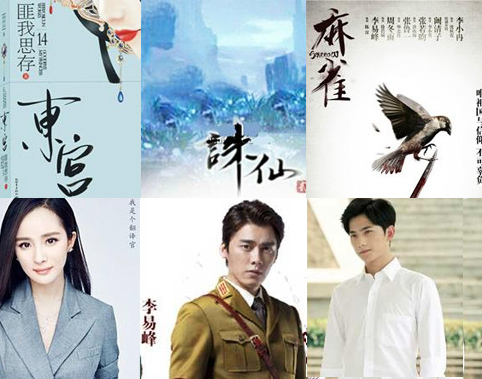 With only two months remaining in 2015, many of mainland China’s television channels have begun advertising their most anticipated dramas for next year. Although book adaptations have enjoyed increasing popularity in recent years, they appear to be reaching their peak in 2016. More than 90 percent of the dramas that are scheduled to air in 2016 are adaptations of online novels or other literary sources. Because many of these stories already boast a deluge of fans, it makes sense for producers to capitalize on such fertile marketing grounds. For instance, the novel Three Lives, Three Worlds, Ten Miles of Peach Blossoms <三生三世十里桃花>, which is penned by Hua Xu Yin <華胥引> writer Tang Qi Gong Zi (唐七公子), is so popular that it will be adapted into a drama and a movie. Even before the cast was announced, netizens were abuzz about which actors and actresses would best be able to portray the story’s two deities, whose romance spans multiple lifetimes. Another popular novel, Just One Smile Is Very Alluring <微微一笑很傾城>, also drew much interest with the announcement of its drama adaptation. Author Gu Man (顧漫) has seen her previous stories turned into successful dramas like My Sunshine <何以笙簫默> and Boss & Me <杉杉來了>. Fans of the original novel are hopeful that Just One Smile, which stars Zheng Shuang (鄭爽) and Yang Yang (楊洋) as avid gamers who get married in an online game and find their romance trickling into real life, will prove just as successful. Two other highly anticipated dramas include the Republican-era Sparrow <麻雀>, which features Li Yifeng (李易峰) as a double agent who is working under Japanese forces but is secretly plotting against them, and Les Interprètes <翻譯官>, the story of a French graduate student (Yang Mi 楊冪) under the tutelage of a translation genius (Huang Xuan黃軒). Both dramas are based on novels. In addition to drawing inspiration from novels, next year’s dramas also feature many stories set in ancient times or in a fantasy setting. The Princess Weiyoung <錦繡未央>, for example, which reunites Tiffany Tang (唐嫣) and Luo Jin (羅晉), is a period drama loosely based on a novel by writer Qin Jian (秦簡). It tells the story of a fictional princess who is rescued by a girl named Li Weiyang. When Weiyang is murdered protecting her, the princess decides to take on her name and exact revenge on her enemies. Likewise, Ice Fantasy <幻城> is a fantasy drama about a pair of brothers who rule the ice and fire kingdoms. Starring William Feng (馮紹峰), Victoria Song (宋茜), and Ma Tianyu (馬天宇), the drama is adapted from a novel by well-known writer Guo Jingming (郭敬明) and is notable for having hired the special effects team from The Lord of the Rings. 2016 will also see a handful of fantasy dramas that originated as online games. The most high-profile is likely Chinese Paladin 5 <仙劍奇俠傳之雲之凡>, which continues the popular Chinese Paladin series, albeit with fresh faces like Han Dongjun (韓東君) and Gulnazar (古力娜扎). Legend of Chusen <誅仙>, which stars Li Yifeng opposite Angelababy (楊穎) and is scheduled to begin filming in December, was also inspired by an online game, which itself was based on a novel. Similarly, Jiang Jingfu (蔣勁夫) and Michelle Chen’s (陳妍希) The Legend of Qin <秦時明月> is a drama adaptation of an animated series that was based on a novel as well. In 2015, producer Hou Hongliang (侯鴻亮) saw two of his dramas, The Disguiser <偽裝者> and Nirvana in Fire <瑯琊榜>, explode in popularity among mainland Chinese audiences. Both were adaptations of novels, which may be why Hou is staying in the book-to-TV market for his next two projects. The first, Ode to Joy <歡樂頌>, will star Tamia Liu (劉濤) and Jiang Xin (蔣欣), in a story of five women living in Shanghai together. The second is titled When a Snail Falls in Love <如果蝸牛有愛情> and has yet to release a cast list or much other information. Nevertheless, both dramas have already had TV channels clamoring for airing rights – a pleasant surprise for Hou, who had previously struggled with securing a broadcast channel for his dramas. They finally able to adapt ‘Legend of Chusen’ again. A decade ago, there was plan to adapt ‘Legend of Chusen’ by a China company. It was going to star Kristy Yang. But, somehow, the plan was dropped due to financial problem I think. Such a missed opportunity. Kristy Yang looks really beautiful in ancient costume. I am quite interested in what Hou Hong Liang offers us next. I was quite please with both NIF amd TD despite their different genres. I put some trust in his taste for choosing the novel as well as the casting. People have been raving about how good “When A Snail Falls In Love” so will be looking out for that. Hope Hu Ge and Hou Hong Liang work together more often in the future. Seriously, after watching TJOF, I am quite worried for “Rhe Lives…” as China doesn’t like reincarnation. Production companies in China should be careful. Don’t over do things or the China Broadcasting Department will come a banning.